An effective synthetic route has been reported to prepare N/B co-doped hierarchical carbon nanofibers (NB-HCNFs) as free-standing electrodes for high-performance supercapacitors. Zeolitic imidazolate framework (ZIF-8) nanoparticles were embedded into polyacrylonitrile (PAN) through electrospinning to obtain PAN/ZIF-8 nanofibers. Tannic acid (TA) acted as a coating layer for PAN/ZIF-8 to generate hollow ZIF-8 core structures within the fiber and an intermediate to coordinate with 1,4-benzenediboronicacid (BDBA). After carbonization, the obtained flexible N/B co-doped hierarchical porous carbon nanofibers were used as free-standing electrodes for supercapacitors. 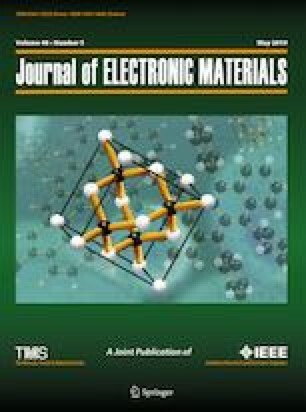 Thus, unique nanostructure and the existence of heteroatoms could offer remarkably improved electrochemical properties with a high specific capacitance (288.2 F g−1 at a current density of 1 A g−1) and good cycling stability (96.9% capacitance retention over 8000 cycles at 10 A g−1). In addition, the NB-HCNFs films were assembled into symmetric supercapacitors, which displayed a high energy density and excellent stability (99.7% capacitance retention after 8000 cycles at 10 A g−1). The synthetic method might provide an effective and facile strategy to prepare a variety of hierarchical doped carbon nanomaterials for energy storage. The online version of this article ( https://doi.org/10.1007/s11664-019-07075-z) contains supplementary material, which is available to authorized users. R.L. acknowledges Shanghai Municipal Natural Science Foundation (No. 17ZR1432200), National Natural Science Foundation of China (No. 21774095), the Open Research Fund of State Key Laboratory of Structural Chemistry (No. 20170014), the Fundamental Research Funds for the Central Universities (No. 0400219376), the start-up funding from Tongji University and the Young Thousand Talented Program. L.H. acknowledges the support by the National Natural Science Foundation of China (No. 21471086), and the K.C. Wong MagnaFund in Ningbo University.